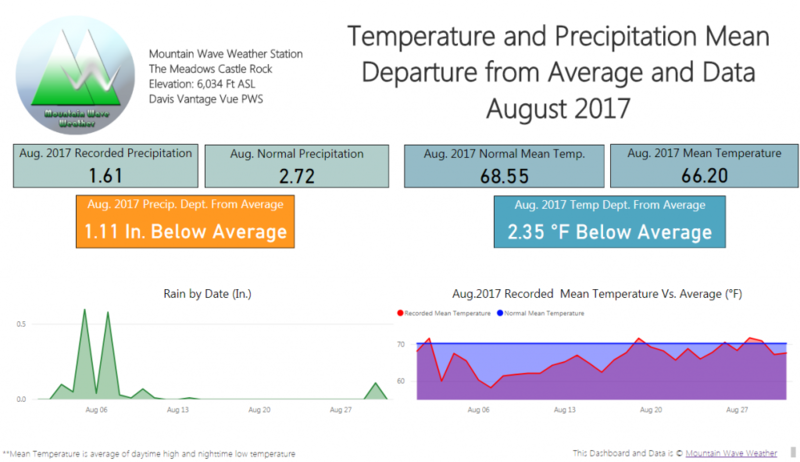 August 2017 was a mixed bag for Colorado in terms of continuing the monsoon pattern. Some areas continued to see rain and thunderstorms while others were left a bit high and dry. In Castle Rock for example, whether you saw above or below average rainfall depended on what side of I-25 you lived on! Keep in mind, my weather station is on the West side of I-25 so depending on where you live around town, you may have seen much more rain than I did. Alternatively, temperatures were pretty consistent for all areas across the Palmer Divide, with nearly everyone ending below average for the month. For the Castle Rock area, the monthly mean temperature finished 2.35 degrees below the 30 year mean temperature. This is pretty notable because August is typically on of our warmest months of the year. Precipitation was a bit mixed, some areas were a bit dry and some areas were a bit wetter. 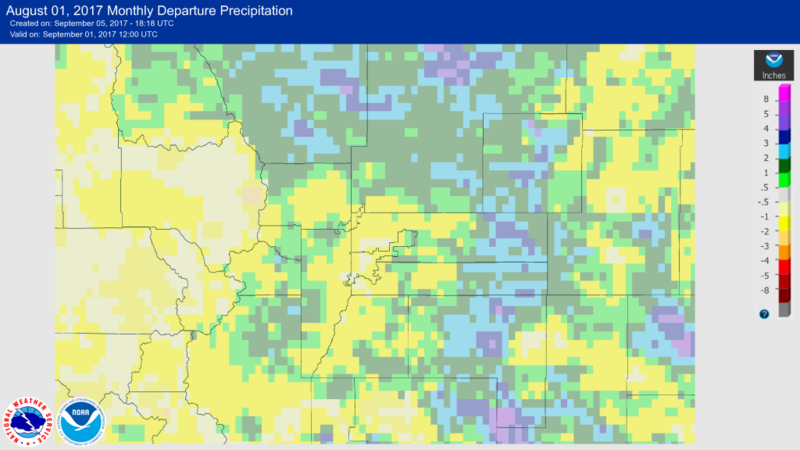 Areas along the Northern and Eastern parts of the state were wetter than normal along with Southeastern Colorado, which saw several large, heavy, slow-moving thunderstorms. In terms of closer to home, areas East of I-25 in and around Castle Rock ended up between .5-1 inches above normal, while areas along the West side of town (like the meadows) were 1-2 inches below average. 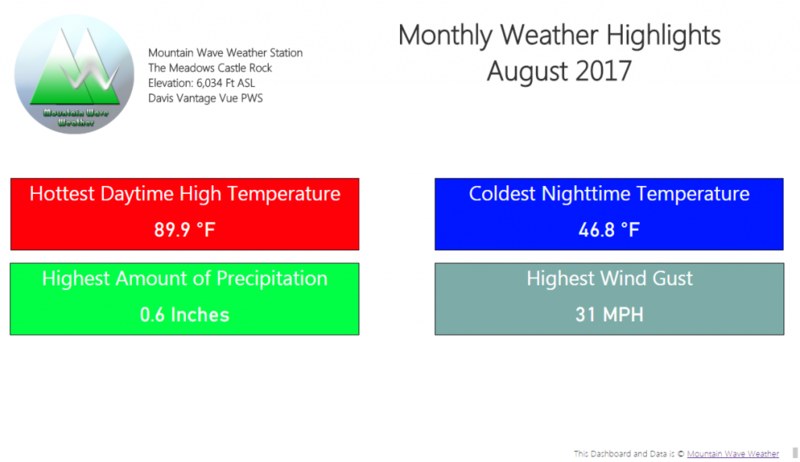 You’ll note that Castle Rock did not hit 90 degrees this August. That is a bit unusual, but not surprising… the daytime temperatures were lower so the nighttime temperatures followed. This meant an overall lower mean temperature and what put the month well below average for temperatures. Climate Prediction Center shows equal chances for above and below average precip along the front range. The mountains however will have a better chance for above average precipitation. Latest CPC outlook for September shows a better than average chance for above average temps across the Western United States. I’d expect lots of ridging to the West and warm temperatures… how Colorado fares with this pattern will depend on where the ridge sets up, and how strong it is. Given the current pattern D’d expect September to start off drier and warmer than normal. I fully expect the month to finish warmer than average given recent trends but would not be surprised to see the month finish close to average (only slightly above) For precipitation, I expect September to finish near normal, but keep in mind that September is a historically dry month!